No, seriously. Read bad books. If you want your writing to improve, pick up a few. They’ll teach you a lot. Great books will teach you little or nothing about the craft. They’re so good they’re mesmerizing. It’s like trying to learn how to be a magician by watching Houdini. He was so adept people never saw what he was doing. His tricks were smooth and seamless. 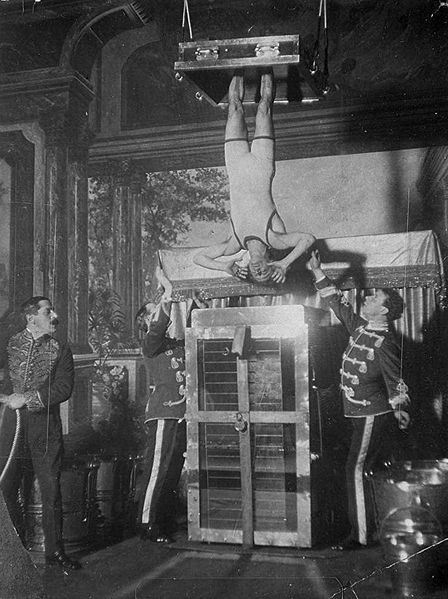 Audiences never suspected the mechanisms behind the curtain, the devices he used to pull off his amazing stunts. But a lot can be learned from a bad magician whose slow card handling, clumsy distractions , and less-than-perfect apparatus shows you how it’s done and more importantly how it fails. Reading a wonderful book is like watching Houdini. But reading a bad book is like watching the Infrequently Amazing Shlumpy. In a bad book, the curtain is falling down and you can see what goes wrong and why. Hopefully you’ll learn not to repeat those kinds of mistakes. I’m not alone in this opinion. This fall I was on a panel at Noircon in Philadelphia with mystery giant Lawrence Block who said he had learned a lot about writing as a young man evaluating manuscripts for a paperback publisher. He saw what worked and what didn’t in unpublished manuscripts and thus learned what not to do. I had a similar experience working for two small book publishers in New York in the 1980s. I read a lot of manuscripts from the slush pile as well as manuscripts submitted by literary agents. I saw many common mistakes and came to understand why they were mistakes. Writing a novel is a matter of choices. Will your hero be like this or like that? Will you write in the first person or third? How fast or slow will you dole out information to keep the reader engaged? How much description will you include? Will your writing be spare and punchy or florid and expansive? How will you handle dialogue? Will you be able to strike the right balance between realistic speech and uploading information needed to further the plot? A poor choice can wreck a novel. It will ripple through the entire work, getting bigger and more problematic as it goes along. So this is why I say, if you want to write a good book, do yourself a favor and read a couple of bad books. You might learn a few tricks.